Behind the Mic provides a roundup of recent news regarding on-air talent, including new deals, departures, and assignments compiled from press releases and reports around the industry. In this week’s edition, ESPN fires Adnan Virk over a reported information leak, Mike Tirico will call an NHL game for the first time in his career, Chris Simms joins NBC Sports, the network’s Bay Area anchor Ahmed Fareed is added to NBC Sports national studio, the on-air team for the NBA All-Star Celebrity game is announced, a pair of talent rounds out Fox Sports’ NASCAR coverage for the 2019 season, and the Overwatch League introduces their broadcast personalities. …For the first time in his career, Mike Tirico will call play-by-play for an NHL game, when the Detroit Red Wings host the Chicago Blackhawks on Wednesday Night Hockey, on Wednesday, February 20, at 7:30 p.m. ET on NBCSN. …Former NFL quarterback and current analyst Chris Simms will join NBC Sports Group exclusively in March 2019 to contribute to its NFL and college football coverage across NBC Sports’ broadcast, cable, and digital platforms. Simms is currently a studio analyst and contributor across numerous NBC Sports TV programs, including Football Night in America, Notre Dame Football, and PFT Live, which he regularly co-hosts with Mike Florio on NBCSN and NBC Sports Radio. …Ahmed Fareed, an anchor and reporter for NBC Sports Bay Area for the past six years, will join NBC Sports Group’s national networks (NBC and NBCSN) to work as a host and reporter on a variety of events and properties. 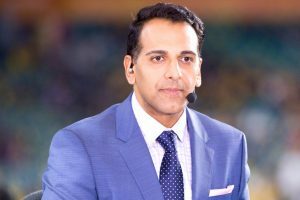 Fareed, who served as a studio host for NBCUniversal’s presentations of the 2016 Rio Olympics and 2018 PyeongChang Olympics, begins his new role hosting Premiership Rugby on NBCSN on March 1 (11 a.m. ET). … Fox Sports finalized the lineup for their 2019 Fox NASCAR studio schedule. The latest additions to the Fox NASCAR roster are veteran TV hosts Lindsay Czarniak and Sara Walsh, who come aboard as studio hosts for NASCAR Race Hub: Weekend Edition and Thursday NASCAR Race Hub shows. Czarniak and Walsh, who split weekend hosting duties for Fox NASCAR, have forged similar career paths on their journey to Fox Sports. …The 2019 Overwatch League unveiled its on-air broadcast talent that will lead fans through this year’s games. Along with the talent returning from the Overwatch League inaugural season, some fresh faces will be joining the team to provide unique insider perspectives and fresh analysis of every exciting Overwatch League moment. Returning to the set are Chris Puckett, Malik Forté, Soe Gschwind, Josh “Sideshow” Wilkinson, Brennon “Bren” Hook, Christopher “MonteCristo” Mykles, Erik “DoA” Lonnquist, Mitch “Uber” Leslie, Matthew “Mr. X” Morello, Auguste “Semmler” Massonnat, Robert “Hexagrams” Kirkbride, and Danny Lim. New members include Wolf Schröder, Seth “Achilios” King, Emily Tang, and Mica Burton.